​With more than 15 years of experience in the Broadcast industry, Kartini Ariffin is the Co-Founder of Dbilique, a personality driven digital channel. Her leadership capabilities have seen her spearheading prominent organisations such as Media Prima Radio Network, Celcom Berhad and Red Communications Sdn. Bhd. Media advocacy and making content that matters is something that Kartini has always been passionate about. She has been invited to speak on Radio related subjects, women and youth developments at various events . Find out more about her other training modules. 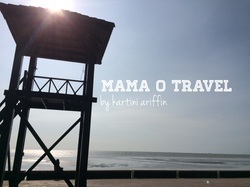 This wanderlust mom has been writing for Mama O Travel - a family travel blog she initiated in 2011. Child friendly accommodations, kids activities and value for money travels are her main highlights. She hopes to inspire other parents to travel with their kids, it's challenging but it's worth it! Check out her travel reviews here. For more than a decade, Tini has strived to carve her name in various industries as a writer, producer, director, educator, TV and radio host, now Tini proudly holds two more titles to her name – as a wife and mother of two loving children. Mama O Drama gives audience a glimpse of Tini, as she tries to find the perfect balance between work and family life... with all the drama that comes with it. ​So buckle up, this is gonna be a ride to parenthood you’ll never forget!